According to the American Veterinary Medical Association, in 2012 New Mexico ranked second in the nation for pet ownership with 67% of the state's households owning a dog or cat. However, finding pet friendly apartment communities in Albuquerque can be difficult, and finding those that accept large dogs next to impossible. But here at Sedona Ridge Apartments we get it. We understand how important it is to have our pets with us - they are family. That's why we offer pet friendly apartments for responsible pet owners! We love your pets as much as we love our own. Please note, the City of Albuquerque requires all dogs and cats have a current license and microchip. For assistance visit their website, where you can license your dog or cat and update your data. View the new HEART Ordinance on the City of Albuquerque's website. Pet owners who lose an animal should contact the Albuquerque Animal Care Center (AACC) at (505) 768-1975 and report the loss within 24 hours. To search for a lost or adoptable pet click here. To look up license information on any dog or cat visit PetData. The pet policy applies to visiting animals and fostered animals. Executed lease pet addendums required for each animal. Veterinarian spay/neuter records are required for approval. Rabies, animal license and microchip records are required at move-in and upon renewal. Executed lease pet addendums required at move-in and upon renewal. Dogs and cats over six months of age must be spayed or neutered. Intact animals (not spayed or neutered and over six months of age) are not allowed. Cats must remain indoors unless accompanied by their owner. Dog owners are required to maintain renter's insurance during their residency. 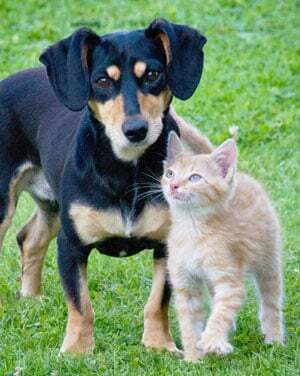 Dogs and cats must have a current annual animal license for each animal they own that is over the age of three months. Dogs and cats must have a current rabies vaccination and be microchipped before the owner can be issued a license. Dogs and cats outside the owner's apartment shall wear a collar or a harness with a current license tag and an anti-rabies vaccination tag at all times. Dogs may not bark excessively. Dogs shall remain on a leash no longer than 8 feet long accompanied by a person able to control the animal. Dog owners shall immediately and thoroughly remove and dispose of feces in approved containers.